The Chinese scooped the mixed double first before Huang Yuxiang (photo) and Zulfadli Zulkiffli crossed swords for the third time after their two meetings last year at the same stage of the same competition. 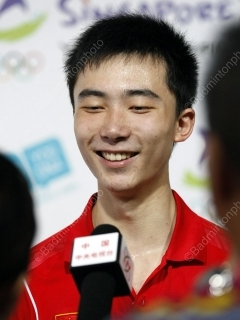 At the time, Zulfadli Zulkiffli had beaten the Chinese in the team event before bowing in the individual. This time, Huang prevailed in the team competition and put China in the lead 2-0 after his convincing 21-16, 21-17 victory. An amazing battle in the men’s doubles saw Malaysia get back in the tie. 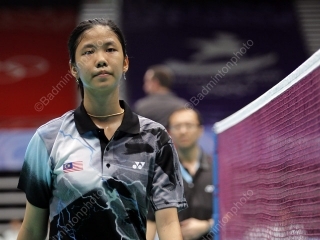 Nelson Heg and Teo Ee Yi Teo overcame Chen Zhuofu and Pei Tianyi in an epic 3-game match, with no fewer than 5 match points saved by the Malaysians before they finally scored on their own 8th match point for a final 13-21, 21-12, 30-29 victory in a symbolic 1hour and 11 minutes. Sonia Cheah (photo) may have been more experienced than her opponent Sun Yu with more exposure on the international stage, especially in the Youth Olympics last summer, yet the Chinese got back after the loss of the first game 18-21 to win the second and third 21-17, 21-14 and seal the tie for China. The individual event was already under way even before the team event had concluded, with China once again looking strong to get most titles, with Malaysians and Indonesians hoping to get their share of medals.